We’re loving the accusonus ERA Bundle. These easy-to-use but powerful tools provide the answers to many nagging problems in audio. Now they’re back with a new addition that tackles vocals with ease. The ERA Voice Lelever uses new patent-pending algorithms to automatically detect distracting level differences in voice recordings and correct them in real-time with the turn of a simple dial. Using the single-knob ERA Voice Leveler, you can save yourself from hours of manual gain adjustments, without leaving your DAW or NLE environment. 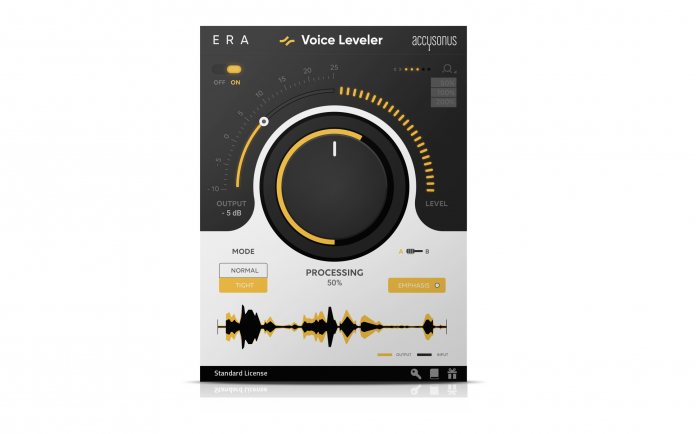 The ERA Voice Leveler is a necessary tool for content creators such as videographers and podcasters, but also musicians and recording engineers. Because it’s not only ridiculously easy to use but also incredibly effective. We’ve condensed the complexity of the underlying algorithmic structures into a single knob! It also features a “Tight” mode that provides a more focused “radio” sound that stands out from background music (e.g. audio and video ads, podcasts, vlogs, etc). The unique “Emphasis” mode automatically detects problems in tonal balance of voice recordings (for example when a speaker is not directly facing the microphone or has moved significantly from the mic between takes/scenes) and applies subtle processing to correct them and ensure consistent tone and intelligibility. “Sounds good but can I see it in action?